A5. Use assessment data to evaluate students' overall literacy performance. This lesson focuses on analyzing and using data at the campus level. Part 1 provides an overview of using assessment data to evaluate students' overall literacy performance and how you may integrate this practice into your literacy assessment plan. Part 2 focuses on analyzing summative, or outcome, assessments to inform instructional decision making. In Part 3, you will consider how your data analysis supports you in evaluating Tiers I, II, and III instruction and setting goals for the future. All of these assessment activities are key in optimizing the RTI problem-solving process and engaging in effective educational decision making. Each supports you in making valid inferences about students' needs, allocating resources to meet those needs, and accurately monitoring students' response to targeted instruction. Now you will consider how to evaluate the overall impact of these ongoing processes by looking at student outcome data. You might consider the following scenario as you begin thinking about this Action Step. A group of medical researchers who focus on heart disease may examine patient data at the group level to explore trends in patients' health needs and the effects of treatment. For example, researchers may identify trends in patient needs that should be better addressed. Further, they may look at different groups of patients receiving different treatments, or combinations of treatments, to determine which treatments are working best and show evidence of improvement in patients' overall health. What areas of strength or need do outcome data indicate should be addressed? Have our instructional decisions made an impact? In core instruction? In Tiers II and III instruction? What challenges do we continue to face in allocating resources and efficiently providing services that target students' needs? How do we address those challenges in the future? In general, analyzing student outcomes is an activity within your campus's assessment cycle that is focused on instructional planning at the campus and/or district level. It includes collaborative analysis and discussion among instructional leaders, teachers, and specialists to address program-wide gaps in meeting students' language and literacy needs. What types of assessment data are used for this purpose? In grades K–5, the assessments you use to evaluate students' overall literacy performance may include an array of tools. One of the most common types of assessment tools used for this purpose is a summative assessment. In broad terms, summative assessments determine if students have learned what they were supposed to learn in a given instructional period. Most commonly, summative assessments are administered at the end of the instructional year, and as Wixson and Valencia (2011) explain, these assessments "determine the effectiveness of instruction and student year-end performance in comparison to grade-level expectations" (p. 468). Standardized, end-of-year (EOY) assessments are most commonly administered for this purpose. The State of Texas Assessments of Academic Readiness (STAAR) is the standardized assessment used in Texas as the basis for determining whether or not students have met grade-level expectations in literacy. However, in grades K–5 (particularly the early grades in which students do not take the state assessment), you may use additional tools to examine students' overall literacy performance. You may look at EOY screener data to evaluate overall student progress in basic early literacy skills. Also, you may use curriculum-based district assessments to measure if students have mastered particular literacy skills at the end of an instructional period. Formative progress monitoring data are generally not considered appropriate for analyzing student outcomes, but you may look at aggregate formal progress monitoring data (for students in Tiers II and III) as part of your evaluation of the implementation of the RTI process as a whole. Looking at trends in progress monitoring data for different student groups (e.g., by specific intervention, by specific need), in combination with other outcome measures, can support you in evaluating the efficacy of targeted literacy instruction. Additionally, language proficiency data (for example, from the Texas English Language Proficiency Assessment System, or TELPAS) is important to analyze to determine if English learners have met yearly goals in English language development. Language development and literacy development in English are strongly related; you and your staff will want to look at data for both language and literacy development as you analyze literacy outcomes for English learners. Previous lessons in this module explain the importance of looking at the validity and alignment of each source of data for the purposes at hand: identifying struggling students, determining specific needs, and monitoring progress toward goals. As you discuss these questions with your team in relation to Action Step A5, you may notice that you are looking at data through different lenses. The goals here are broader because you will be looking more globally at the effectiveness of instruction and intervention across the school and grade levels. As you use data to determine the effectiveness of your overall program, you might consider what criteria would enable you to determine exactly how well an initiative or program is succeeding. Part of your discussion will also include deciding what other information you might need to effectively evaluate the implementation and outcomes of literacy instruction so that you can make solid decisions for next steps. When used appropriately, summative assessments can support educators in analyzing their own instruction and targeting areas of improvement for practice. On a wider level, analyzing outcome data can inform school leaders of ways to improve their RTI framework, as this practice is focused on evaluating the effectiveness of a program, intervention, or the overall literacy curriculum (Ball & Christ, 2012). As part of your campus assessment system, you and your staff should be already engaging with these questions multiple times throughout the year. You can identify learning problems through screening and diagnostic assessments, and you can continuously engage in program evaluation and planning as you determine ways to address those learning problems and monitor progress toward set goals. Examining data from summative, or outcome, measures provides another opportunity for you to evaluate the educational decisions you have made, allowing you to look at trends across classrooms, grade levels, student populations, and even campuses within a district to better understand the effectiveness of the RTI framework as a whole. Collecting and analyzing data on students' overall literacy performance is important to the evaluation of both core (Tier I) and supplemental (Tiers II and III) instruction. As part of your data-analysis process, you will want to examine what the data is telling you about instruction in all tiers. 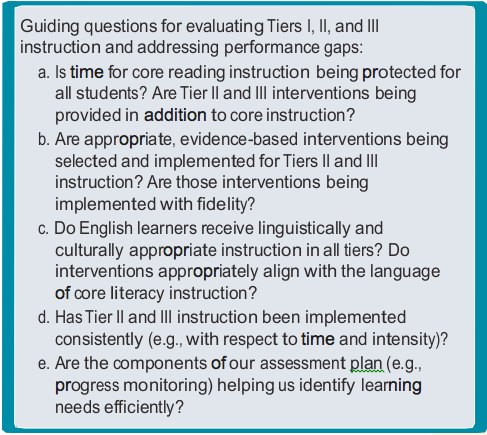 Quality, evidence-based Tier I instruction is at the foundation of an effective RTI framework, and without it in place, it is likely that the need for Tiers II and III instruction will exceed available resources. Thus, using summative data to evaluate Tier I instruction should be considered a critical step in evaluating the RTI process at your campus. Likewise, it is important that the analysis of summative data be extended to the evaluation of Tiers II and III instruction, and you and your team will want to ensure that this activity is integrated in the decision-making process for students receiving additional support (McDougal, Graney, Wright, & Ardoin, 2010). Disaggregating outcome data for students receiving Tiers II and III interventions will help you identify trends within and across these groups. If there are significant numbers of students in Tier II or III not making adequate gains, you have reason to further evaluate the efficacy of that intervention instruction. In turn, if there are significant gains made by particular groups of students in specific interventions, you will want to identify why those practices were successful and coordinate resources to ensure those practices are implemented across intervention groups. You may want to download a copy of the entire flow chart Analyzing Outcome Data to Inform Action: Questions to Guide the Process. When making decisions about students within an RTI framework, intervention integrity is a critical factor to consider in the problem-solving process. This pertains to how well tiered instruction is delivered "with regard to content, quantity, and process" as part of your RTI program (Ball & Christ, 2012, p. 237). Another common term used for this characteristic is fidelity. Fidelity of the intervention program refers to the quality of its implementation and the degree to which practitioners "implement programs as intended by the program developers" (Using Fidelity to Enhance Program Implementation Within an RTI Framework, Center on Response to Intervention). When determining the degree to which students have met yearly goals, it is important to measure and evaluate the fidelity of instruction delivered to those students and to identify any departures or modifications made to intervention instruction (e.g., modified pacing, inconsistency in time allotted or daily schedule). You and your team will need to determine how you can measure the fidelity of implementation and what impact any deviations have had on student learning, and then you can plan for ways to address any gaps in the delivery of instruction within your RTI framework. As part of your instructional planning, you may consider ways to better measure fidelity of instruction to ensure that students are receiving high-quality, evidence-based intervention instruction before making decisions about students' future needs. There are a variety of tools that can help measure and monitor fidelity. The Monitoring Fidelity in RTI webinar, available on the Center on Response to Intervention site, is one helpful resource for understanding fidelity in RTI. The webinar also discusses specific tools that may help you monitor the integrity of intervention instruction. In sum, as you engage in data analysis and critical discussion of these issues, you and your team will want to determine Action Steps to address any identified gaps. As part of the cycle of data-based decision making, you will want to ensure that instructional staff collaborate to set program-wide goals for the next year and create a plan to meet those. As the cycle continues, you will use your balanced assessment plan to determine the impact of your instructional plan and the degree to which goals are being met. This cycle of data analysis and decision making is part of the practice of creating, evaluating, and revising your data-informed plan for improving literacy instruction, as introduced in the Leadership module of this course. TO LEARN MORE: Extensive research and resources are available on the topic of using data to inform educational reform efforts. These resources can provide guidance as you establish and maintain this process at your campus in a way that best aligns with the needs of educators and students in your particular context. The Center on Response to Intervention's Implementation & Evaluation section provides information about RTI implementation, implementing RTI with fidelity, and evaluating your RTI framework. It contains a variety of guidance documents and training modules related to these topics. The English Learner Institute for Teaching and Excellence: Project ELITE has materials available for conducting BOY (beginning-of-year), MOY (middle-of-year), and EOY (end-of-year) structured data meetings. The EOY materials provide guidelines and protocols for evaluating students' overall literacy performance in grades K–3 and planning RTI instruction, with specific considerations for English learners. Click on the 2013–2014 tab under “Resources” to find the Structured Data Meetings materials. Brown and Doolittle's (2008) practitioner brief titled A Cultural, Linguistic, and Ecological Approach to Response to Intervention with English Language Learners provides guidance in ensuring that the RTI framework is implemented to meet the unique needs of English learners. Practitioners can find guiding questions to consider when evaluating intervention decisions made about English language learners and the integrity of instruction in each tier. It is available on the Center on Response to Intervention site. REL Mid-Atlantic conducted a webinar, Root Cause Analysis, which provides an outline of root cause analysis and several resources to help educators implement root cause analyses for problems that arise on their campuses. Root cause analysis can be a powerful method for educators to analyze data in new ways and identify the root causes of events. This type of analysis can help you avoid the pitfall of trying to solve the "wrong" problems and missing the root causes of the issues at hand. Determine how data are being used to evaluate the effectiveness of programs as they are being implemented. Discuss how outcome data are used to make instructional and programmatic decisions. You might use the third and fourth columns of the Assessment Audit to think through these issues. Gather and review the intervention materials (e.g., teachers' guide, instructional manuals) to determine if interventions are being delivered as designed. Determine which staff members have been trained in analyzing summative data and plan necessary professional development to address staff needs in this area. Determine procedures for gathering and sharing additional data to support valid decisions for all students and student groups, such as English learners. With your site/campus-based leadership team, review your team’s self-assessed rating for Action Step A5 in the TSLP Implementation Status Ratings document and then respond to the four questions in the assignment. Refer to Part 1 for an overview of using assessment data to evaluate students' overall literacy performance. Refer to Part 2 for information about analyzing summative data for instructional planning purposes. Refer to Part 3 for information about using summative data to evaluate literacy instruction in Tiers I, II, and III. Ball, C. R., & Christ, T. J. (2012). Supporting valid decision making: Uses and misuses of assessment data within the context of RTI. Psychology in the Schools, 49(3), 231–244). McDougal, J. L., Graney, S. B., Wright, J. A., & Ardoin, S. P. (2010). RTI in practice: A practical guide to implementing effective evidence-based interventions in your school. Hoboken, NJ: Wiley & Sons. Wixson, K. K., & Valencia, S. W. (2011). Assessment in RTI: What teachers and specialists need to know. The Reading Teacher, 64(6), 466–469.